eBay Brand New Men's Women's Kids Watches Silicone Rubber LED Watch Date Sports Bracelet Digital Wrist Watch, Fast & Free shipping from the USHigh quality, with its elegant and contemporary design, it is very popular. A perfect gift for friends, families, lover, coworkers or yourself. LED digital display time, date and seconds Bracelet Design: Fashion bracelet watch design. Fits adults and kids. 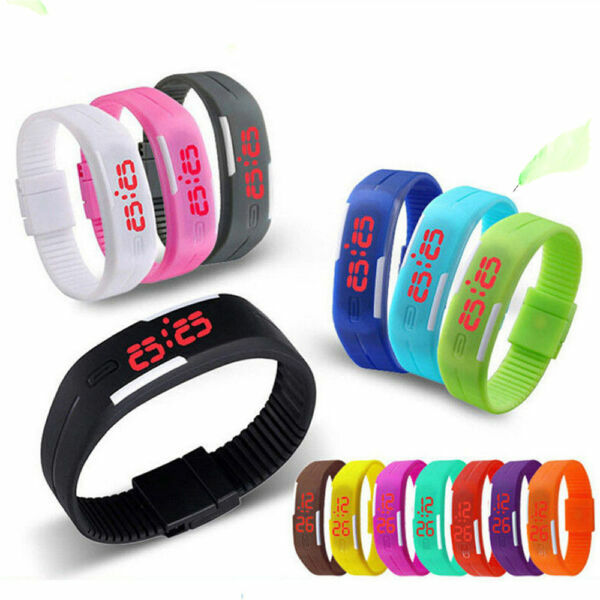 The silicone band can be cut to fit for small wrist easily Suitable softness and comfortable wear With magnetic clasp, easy to wear Water resistant, suit for wash hand (not for hand wash, shower, swimming, diving etc) Watch band length: 5.8-8.2inches, band width: 0.9inchesThe band size is adjustable to fit kids wrist: On the two ends in the band, the magnetic piece can slide out. Then, you may cut the band length to fit your wrist. After cutting, you may slide the two pieces back to the band. How to set Time/Date: 1. Press the Button to display the time, then long press the Button until the Hour flashing. 2. Press the Button to set the Hour number, the number increases by every press, confirm the number you want. 3. Long Press again, the Hour number is steady, then Minutes blink, do the steps like the Hour setting. 4. After setting the current Time, long press the Button to enter the next mode Month/Date. 5. Follow the above steps to set Month/Date Notice: When setting the Time/Date, please make sure the LED display screen is blinking, if the LED shut down, it should be re-adjusted. Powered by eBay Turbo Lister The free listing tool. List your items fast and easy and manage your active items.